File photo of one-horned rhino with its cub. 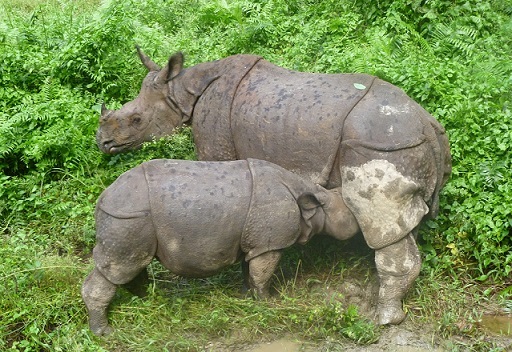 Quoting the Deputy Director General of the Department of National Park and Wildlife Conservation (DNPWC) Gopal Prasad Bhattarai the report said the government planned to send the rhinos on July 12. The process of sending one-horned rhinos gathered momentum after a Chinese high-level team’s recent visit to Nepal. An eight-member team constituting six top officials from the Convention on International Trade in Endangered Species (CITES) of Wild Fauna and Flora China chapter and park officials reached Nepal last week. The team led by Director General of CITES China also includes officials from Chimelong Safari Park and Shanghai Zoo which will host the rhinos. The Chinese team visited the Chitwan National Park (CNP) to inspect the condition of the two rhinos after being captured for gift purpose. These rhinos, captured in late April, have been kept under observation in an enclosure. The plan of gifting rhinos to the China was revived after the high-level visit. In July 2016, the government had decided to gift two pairs of rhinos to China. According to DG Khadka, the rhinos will be transported to China on a chartered flight. The CNP is making four special boxes for the purpose. Another pair of rhinos will be sent to China in the next fiscal year.